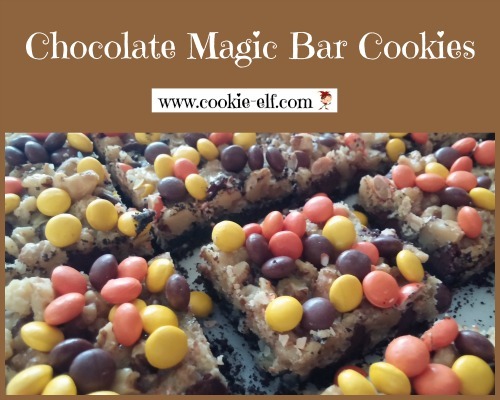 These Chocolate Magic Bar Cookies mimic the original Magic Bars, but with a fun variation for chocoholics out there: the crust is made from chocolate sandwich cookies rather than graham crackers, as is traditional. When you sprinkle chocolate or peanut butter candies on top, you add another layer of flavor. Who says you can’t have your cookies and candy… and eat them, too? Line a 13 x 9 baking pan with aluminum foil. Spray the sides of the foil to prevent bars from sticking to the sides of the pan. Cut butter into the pan. Set the pan in the heated oven to melt. Remove the pan from the oven. Sprinkle the cookie crumbs over melted margarine. With a spoon, combine margarine and crumbs until they are well mixed. Gently shake the pan back and forth sideways to allow excess crumbs to be absorbed. Use the back of the spoon to press the mixture evenly into the bottom of the pan. Sprinkle chocolate chips, chopped nuts, and coconut evenly over crust. Pour sweetened condensed milk evenly over bars. Use an angled spatula to spread milk into spots that are not covered. Bake bars 25-30 minutes. Remove the pan from the oven. Sprinkle candies on top of bars immediately. Use a plastic spatula to press candies into the surface of the bars to stick. Allow bars to cool completely on a wire rack. Lift the foil out of the pan and set the bars onto a cutting board. Peel away foil. Cut the bars. The chocolate candy coating on M & M’s or Reese’s Mini Pieces will crack with heat. That is why this recipe calls for sprinkling them on the cookie surface as soon as you remove the bars from the oven. Sprinkle the candies on the bars immediately. If you wait too long, the candies won’t adhere to the bar cookies. Get more fun and easy bar cookie recipes on our Pinterest board.